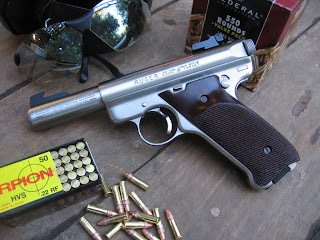 One of the pistols that I make no apologies for enjoying shooting is the Ruger MKII. 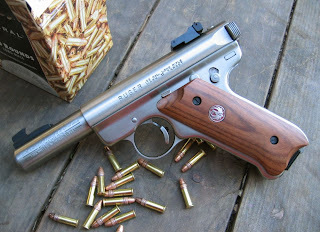 Regardless of the misguided statements Bill Ruger made late in life, his rimfire pistol is an American firearms masterpiece. Even though it requires know how similar to a secret handshake to reassemble, the Ruger pistol is a very basic, simple instrument that gets the job done on a budget with a longevity that will outlast most owners. Several readers have emailed me to ask about the particular pistol that I start new shooters on. 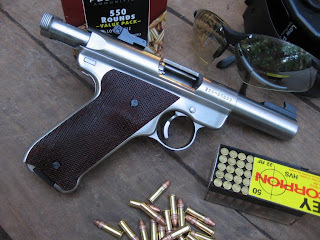 Frequently, this Ruger MKII is the first gun they fire. It was a special order gun, a stainless four inch bull barreled model. I installed a Volquartsen sear, hammer, and trigger. The sights are stock. The Volquartsen trigger group gives the pistol an unmatchable crisp single action trigger pull. The four inch bull barrel gives it a balance like few other 22 pistols I have handled. These qualities plus the low cost of ammunition and near absent recoil make this the ideal pistol for a beginner to learn on. Being the perfect handgun for a beginner does not mean this pistol is less than what it should be, however. A beginner's pistol should be durable, easy to maintain, easy to use, and reliable. Fighting with contrary equipment is the quickest route to turning off a new shooter. This particular Ruger MKII is extremely accurate as well as being very easy to handle. I frequently use it myself for low cost training. It's an accurate, reliable, portable 22 caliber lead launcher. A hoot to shoot. 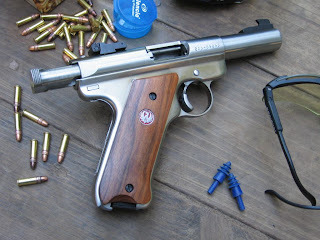 One of the things I always wished I could change on the short barreled stainless Ruger though was the grips. The blond grips with the red Ruger medallions were pretty, but they just did not fit my hand the way I wished. One would think that as popular as the Ruger MKII is, nice grips would be more common. They can be found, but they frequently top $50 a pair. Thus, when I found a pair of checkered cocobolo grips with palm swells listed at CDNN, I quickly ordered a pair. It took two days to receive my package from CDNN, and I was surprised to see that they gave me a break on shipping. The one thing that sometimes keeps me from ordering small parts from the Abilene, Texas gun emporium is that they typically use a flat rate for all shipping. A twenty-six dollar set of grips is not that great a deal if the shipping is fifteen bucks. At seven and a half for shipping, the deal becomes tolerable. I have never been a proponent of thumb rests on handguns. I am of a mind that individual hands are unique, and unless a given grip is crafted for a given hand, protrusions on the grip are as likely to be cumbersome as they are beneficial. That being said, when I screwed these grips onto the Ruger MKII this afternoon, they totally transformed the pistol. The grips fit my hands perfectly. The pistol now points like a natural extension of my hand. Nugun agrees on the Ruger 22 pistol as a first gun. I started my wife on the Mark II and she loves it. It's an excellent pistol for introducing a new shooter. I love my 10" Mark II. Now if only I can find a short barreled Mark II, I'll be set. Ruger sell the medallions. Love the blog! I recently purchased a MkII at the recommendation of a friend and agree with everything you've stated. It handles beautifully! Today I started teaching a friend how to shoot. He's never fired a gun before but owns two, and is scared to death of both of them (a Tanfaglio 380 and a Mossberg 500). But after an hour of covering just basic stuff like the four safety rules, proper grip, stance and trigger pull, he's excited about learning and can't wait to try live fire at the local range. Thanks for the entries on teaching your friend QJ how to shoot. At Home Depot, ask for the sandpaper-like traction tape for stair steps. You'll also find it (at 4X the price) at skateboard stores -- they call it "grip tape." Regardless, cut a narrow piece and add it to the Ruger's backstrap. The gun feels a whole lot more secure in my hand and it tends to stay put much better after a shot. I'm ordering a set of the grips you mentioned. Thanks! Xav, I have a Mk II 6" Gov. target model in layaway at my local pawn broker and the thing is absolutely filthy and in serious need of a good cleaning, therefore it will need to be field stripped and cleaned thoroughly when I get it paid off. You are not the first to mention the "secret handshake" methodology of reassembling the weapon. I have looked about on the web for clarification as the Ruger manual is less than clear (I'm a visual sort and don't grasp written instructions well without pictures to go along with them.) Could I beg a favor and ask you to consider putting together a comprehensive pictorial on the dis/reassembly of a Mk II? I think you would do a good job, you would have made an excellent tech writer I think. The bit about how you can completely trash the gun if you reassemble it wrong and then try to fire it has given me real pause. The MKII hammer simply will not fall and the pistol will not fire if it is reassembled wrong. You will not trash the gun unless you apply a small sledge or a vise. The problem is the hammer strut placement when the HSH is reinserted and snapped into place. Whuile the MSH is being mnoved into place, the strut must fall into the cup atop the mainspring. The trick is having the muzzle up while you work the back of the gun. Strange at first, but natural thereafter. The Ruger manual describes it very well, some people simply don't want to follow directions. One of the best online resources for field stripping the Ruger MKII can be found here. If you are inclined to detail strip the pistol, this page will help. Enlarge the photos to guide you. I could not do a better guide than this gent. Happy memories of my bull barreled MK1. It's probably doing it's duty now allong with my P38 and the rest of Britain's legally held pistols post '98 -- as a manhole cover or something like. Thanks Xav, that was exactly what I was looking for. I erred in my previous comment. The grip tape addition on my Rugers is to the front strap, not the back. It is a significant help with the chromed and therefore slippery front strap. Drove to Silverdale for 9mm ammo at Sportsman's WH yesterday. On the way I thought: Boerner's gun shop is just 10 miles further. Why not check it out? Damn. They had two never-sold MK II's. Bought the 4" in blue. Now that I think about it, I may have to make a return trip to get the 6 7/8" in SS. Made my way to Sportsman's all warm and fuzzy until I found they had no 9mm. None. In .45, they only had UMC 230 gr FMJ in 250 rd bricks. Oh, well. Someone has to buy it. That, and 4 bricks of Federal .22 and couple hundred rounds of 380. Drove the 60 miles home happy as a clam. Xavier: The MkII manual has no warning about dry firing. I have been trained that dry firing a .22 can damage the firing pin. Do you agree that that is true for the MK II's? The MKII (and MKI and MKIII) has a crosspin running through the bolt that limits the firing pin travel. As long as this crosspin is in place, the Ruger rimfire pistols are safe to dry fire. You will only be able to see the crosspin when the bolt is removed. There is no reason for it to be missing unless some knucklehead removed it and did not put it back in. Jr. and I will do some dry firing and then it's off to the quarry. Maybe we will find a few rusty cousins of your evil looking eyetalian spaghetti cans. The MK II has laminated wood grips with the thumb rest. In all, it holds better than my 50 year-old Standard. The 4" bull barrel has much better balance in my 70 year-old hand. Less front sight wander. Trigger is more crisp. I guess were I a newer model, I would have better balance and a crisp trigger.